he County’s 2017 Prescription Drug Abuse Report Card shows 253 fatalities last year. That is five more than in 2015, but 15 fewer than in 2012 when the highest number was recorded. The number of ipioid-related deaths has decreased slightly since 2012, the highest on record. 7,501 visits to local emergency rooms in 2015, compared to 6,866 in 2013. 14 percent of 11th graders reported prescription drug abuse in 2015 vs. 13 percent in 2013. 49 percent of adults arrested reported misusing prescription drugs in 2016, compared 42 percent in 2015. 31 pharmacy store burglaries and robberies occurred in 2016 vs. to six in 2015. 40 percent of juvenile arrestees reported abusing prescription drugs last year vs. 43 percent in 2015. The County and its multiple partners began addressing the prescription drug abuse problem in the region nearly 10 years ago. In 2008, the County Board of Supervisors established the Prescription Drug Abuse Task Force, which includes the County Sheriff’s Department, the District Attorney, the Health and Human Services Agency, the U.S. Drug Enforcement Administration, and multiple other key partners including local law enforcement, treatment, and health and prevention organizations. 91 deaths from heroin last year, compared to 90 in 2015. 28 percent of people who entered treatment in 2016 did so because of heroin, compared to 28.6 percent in 2015. 11 percent of adult arrestees tested positive for heroin in 2016 vs. 12 percent in 2015. 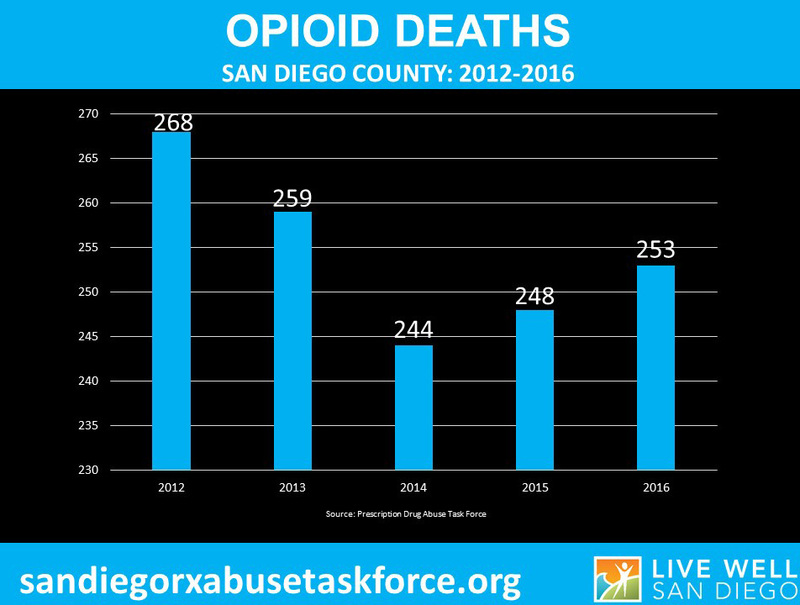 Preventing drug abuse and getting people into treatment is one of the goals of the County’s Live Well San Diego vision, which aims to improve the health and safety of residents in the region. The County funds prevention and treatment services throughout the region. Treatment is available by calling the County’s Access and Crisis Line at (888) 724-7240. Everyone is encouraged to get rid of unused medications so they don’t fall into the wrong hands. Safe disposal and collection of prescription drugs started in 2010. Last year, San Diegans turned in nearly 16,000 pounds of prescription drugs at San Diego County Sheriff’s collection boxes and another 18,000 pounds during take-back events. That is nearly 17 tons of prescription drugs. The next Prescription Take-Back Day is Saturday, Oct. 28. from 10 a.m. to 2 p.m. Individuals can take pills and other solid forms of medication to one of almost 5,000 collection sites manned by more than 4,000 partners nationwide. (DEA cannot accept liquids, needles or sharps.) They can find nearby collection sites at www.DEATakeBack.com or by calling 800-882-9539. The service is free and anonymous, no questions asked.